Warming to my theme yesterday of getting more from your website analytics, I wonder how many of you are even getting regular reports from it? I don’t mean spending twenty minutes printing out random charts before a marketing meeting, I mean scheduling regular – e.g. weekly – reports to be emailed to you, either as graphs or tables of Excel data. Google Analytics makes setting this up as easy as it could possibly be, so there’s no excuse really. The hardest decision is deciding which reports you need to see, and over what period. 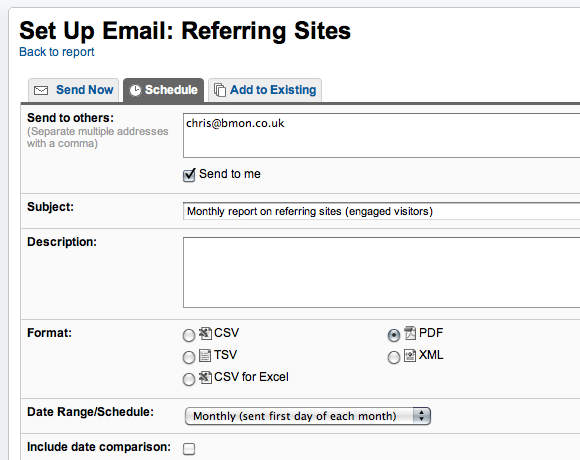 I like to see the sources of engaged visitors on a monthly basis, for example. Again, if you’re an Insider Programme member and need some help, just drop me a line. And if you’re not a member, why not come and join us in 2011?